I have only been physically inside a courtroom once, and that was to support a falsely accused colleague. It struck me that a typical western courtroom is set up not to exude justice but to intimidate, not just the accused but all people present, with the power of the State. The judge is invariably seated centrally on a dais, able to observe all that transpires below in the courtroom. When the judge enters, all present are required to stand, and none may be seated until permission is granted by his “honor.” When the proceedings are displeasing to her honor, she may strike a gavel on the dais to summon order in the courtroom. Witness the power of the State: the power to mete out punishment for persons found guilty of something the State has determined to be illegal. It is a power that may be, and has been, wielded in what would be construed to be a thoroughly criminal manner in a moral universe. After all, gift giving and dancing were once deemed illegal by the Canadian State, and thus the tradition of First Nation Potlatches were banned until a sense of sanity and seeming propriety prevailed. Such legal chicanery is not surprising to those who subscribe to Emery Dahlberg’s admonition that power corrupts. When law is unjust or when the punishment for wrongdoing is unjust, then the State has abused its power. The State’s power to prescribe justice can, moreover, be argued to represent State violence – in that the threat of punishment is used by the State to coerce behavioral compliance with the societal norms as dictated by the State. To any informed person, Canada is undeniably a nation state erected on pre-existing nation states. The founding of Canada was unquestionably rooted in the genocide of the Original Peoples of the territory. Genocide is a heinous act often rooted in racism and supremacism. One group of humans considers itself privileged and accords itself rights, god-given or not, to the land and resources regardless of whichever people inhabit such territory or how long the territory has been the domain of its inhabitants. That the law is not a moral construct is adduced by the fact that it has served as a vehicle for carrying out great crimes. The so-called New World was gifted by the Papal Bull Inter Caetera (1493) for division among the Spanish and Portuguese. Non-Christian savages had no rights according to the papacy. Albeit this was later superseded by the Papal Bull Sublimis Deus (1537). Nonetheless, the entirety of the western hemisphere remains controlled by elitist European settler-colonialists. Hence, Original Peoples find themselves stripped of sovereignty, ethnically cleansed from gargantuan swaths of unceded territory (reality check: who knowingly agrees to ceding a people’s territory anyway? ), marginalized from decision-making regarding their lands, with many people having been forcibly assimilated into the dominating culture. How to achieve actual justice for the dispossessed? Bruce Clark is a man who made his living in the courtroom as a lawyer. He is an expert in law as applied to Indigenous peoples, having achieved a doctorate in comparative jurisprudence. Clark believes in the notion of applying law to achieve justice. Justice is a concept that is higher than the self, thus Clark took on the establishment to seek justice for his Indigenous clients. In the end he was punished for his zeal for justice. I first became aware of Bruce Clark when he was providing counsel to the Sundancers at Ts’Peten (Gustafsen Lake). To protect the claimed rights of an American rancher to property on unceded Secwepemc territory, the provincial government resorted to para-military measures to evict the Sundancers; it was astoundingly reprehensible to me. Natural law was stood on its head by the provincial authorities. It is a matter that all “British Columbians” and “Canadians” should make themselves deeply informed about and act thereupon according to their consciences. Bruce Clark is speaking and writing words extremely discomfiting to many non-Indigenous people. He is the author of Justice in Paradise and Native Liberty, Crown Sovereignty: The Existing Aboriginal Right of Self-Government in Canada. 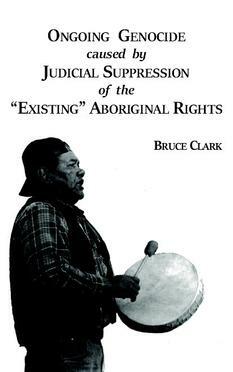 Just published is a collection of Clark’s subsequent writings, Ongoing Genocide caused by Judicial Suppression of the “Existing” Aboriginal Rights. In Ongoing Genocide Clark presents the legal case for Indigenous sovereignty such that the layperson can readily grasp the arguments. Clark examines the constitutional law, international law, and case studies based on the law of the invaders. When interpreted without bias, the compelling arguments of Clark strongly refute any credence to the newcomers’ doctrine of discovery, especially over lands previously inhabited for millennia. That invader courts should have any authority in the territory invaded is, on its face, risible. A number of court decisions are mistakes, per incuriam, and are not a binding precedent, writes Clark. Clark cites legal documents and precedents, in particular, the Royal Proclamation of 1763 which sets aside the Hunting Grounds to Indian nations in which the Indians are to be unmolested. Clark has tried to challenge the constitutionality of Canada’s usurpation of Indigenous territory. A Catch 22 has been designed to block this. Clark relates how the Supreme Court demands a lower court ruling on the matter while the lower courts insist it is a Supreme Court matter. (p 127) It is clear to Clark that an independent, third party adjudication is required, this having already been established in the 1703 case of the Mohegan Indians v. Connecticut for Indian land claims throughout British North America. Pressing to have his legal arguments heard and a decision rendered in court ultimately cost Clark his career as a lawyer. But this was not the end of Clark or the quest for justice. Clark touches upon many topics in Ongoing Genocide among them the effects of Indian Residential Schools, the Indian Act, the Truth and Reconciliation Commission (“… an expensive fraud upon the public but a cruel imposition upon the victims, who are encouraged to air their innermost suffering in the mistaken belief that it will lead to closure.” [p 20]), the so-called 60’s scoop of Indigenous children, and more. The book concludes by pointing out an error in the Supreme Court Case Tsilhqot’in v. British Columbia, 2014 that is at odds with precedents such as the Royal Proclamation of 1763 and section 109 of the Constitution Act, 1867. In recent years the BC provincial government and federal government have apologized for the wrongful hanging of six Tsilhqot’in chiefs. Despite this, the BC government and Taseko Mines have continued to undermine Indigenous sovereignty, with repeated attempts to set up and operate a platinum mine in the Tsilhqot’in nation. Ongoing Genocide caused by Judicial Suppression of the “Existing” Aboriginal Rights puts forward the case over which Canadian law courts dare not deliberate. That should not preclude people of conscience becoming informed. Is Canada a just society? Read the book and judge for yourself. Then do something about it. Humanity requires many more brave warriors like Bruce Clark. I hold that Dahlberg’s aphorism should not be considered too simplistically – that it has many layers. E,g, there is probably something already present in the nature of many humans that leads them to covet power. See Tom Swanky, The Great Darkening: The True Story of Canada’s “War” of Extermination on the Pacific plus The Tsilhqot’in and other First Nations Resistance (Burnaby, BC: Dragon Heart Enterprises, 2012). Read review. A noteworthy exception is Warisata (Bolivia) which has been governed by an Indigenous president, Evo Morales, since 2006. Emilee Gilpin, “Minister Carolyn Bennett says exoneration of Tsilhqot’in chiefs opens door to reconciliation,” National Observer, 27 March 2018; Tom Swanky, “Exoneration of the Chilcotin Chiefs,” 10 September 2015.